Hallo, hallo to my new blog. You’ve done it. This is the first post. You cannot go back any farther. 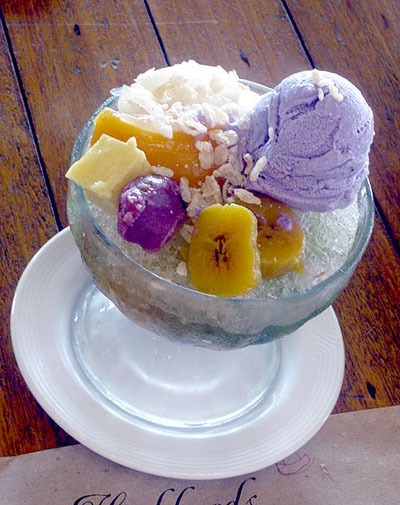 Instead of a Golden Ticket, you win a taste of Halo-Halo, one of my favorite desserts. If Mr. Wonka was Filipino, he could have created this crazy, psychedelic, you-put-what-in there?! concoction. Americans used to a decadent sundae, slathered with Hershey’s syrup, M&M’s, whipped cream and peanuts might think they’ve seen the height of ice cream heraldry. But they have no idea. Oo, it’s bright purple. That would be the ube ice cream, made from a purple yam. And yes, there’s tropical fruit, like bananas or plantains, jack fruit, On a mound of crushed ice. Soaked with milk. Maybe with a few red beans floating down in the bottom. Cubes of jelly-like gelatin. And that might be rice on top, because, well, Halo-Halo is Filipino, and rice is nearly required by law. In fact, that photo above doesn’t do it justice. I confess I was a little skeptical. Slushy ice and milk are usually separate houses in my church of dessert. Red beans evokes beef chili, ew. 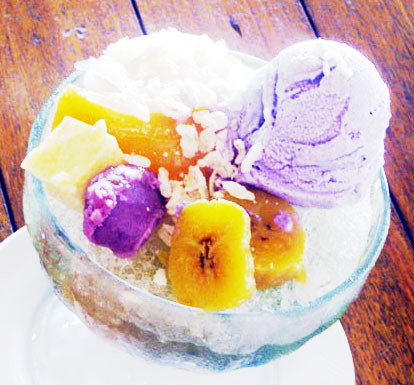 But of course, there’s a reason Halo-Halo is so beloved. Don’t try to eat it piece by piece. Churn it up. Let the ice tinkle in the milk, the fruit swirl with the beans, the leche flan sink down into the delicious sweet goo. It’s marvelous, as refreshing and surprising as anything I’ve ever had. The Philippines in an ice cream bowl. If you are hankering for your own, I’m sure it wouldn’t be too hard to make.